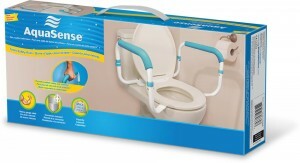 Provides added stability for getting safely on and off your toilet! These new safety rails secure to both standard and elongated toilets using the existing bolts. What’s more, installation is simple and the arms offer sturdy support that doesn’t get in the way, compared to models that have a bar across the bowl. We all seek independence and comfort in our private lives. Our new AquaSense toilet safety rails fulfill those needs with a product that’s also aesthetically pleasing and easy to use! 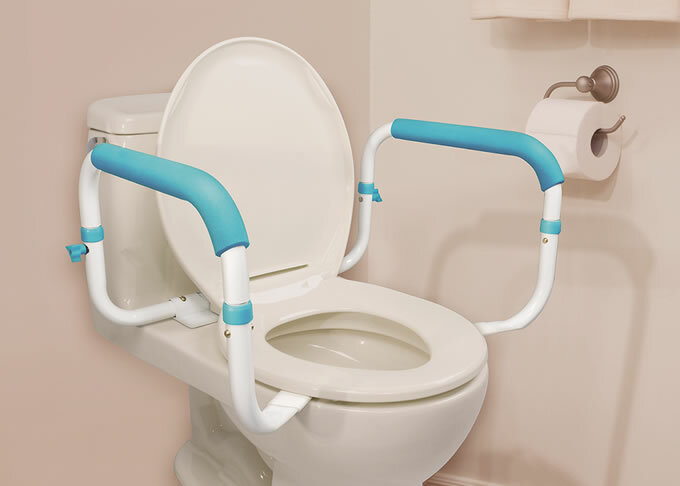 Whether you’re post-surgery or thinking about providing your grandmother with independence in the washroom, these rails will provide added support for getting safely on and off one’s toilet. You can also use it without handles for maximum space and easy access. These AquaSense® Toilet Safety Rails make it safer and easier to get on and off your toilet, and are aesthetically nice and extremely easy to assemble.